Poised silently still in the thick undergrowth, you lie completely motionless as you watch your prey walk unknowingly into your line of fire. Looking down the long, sleek barrel of your M16 gun, you steady your aim and prepare yourself for the imminent battle. Completely kitted out in your full-length combat suit and body armour, not even Rambo himself looked this good. As you pull the trigger on the impressive all black semi-automatic gun, a single paintball catapults out of the barrel and hits the target from 60 feet. Perfect shot! Available at selected Delta Force National Paintball centres, the M16 replica machine gun is available for hire for all aspiring Rambos and Ramboettes. 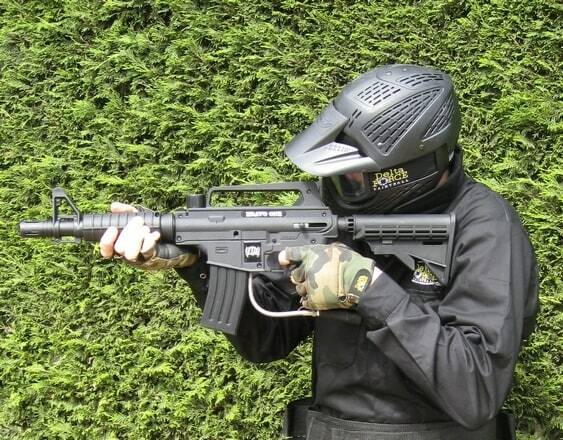 Complete with an 11″barrel, built-in sight, collapsible stock and removable magazine, the M16 gun upgrade is the perfect accessory to make your day of paintball the ultimate paintball event! The M16s are only available for rental on the day of your event, and numbers are limited so be sure to secure your M16 before it’s too late. If you like the look of the M16 paintball gun, why not check out our assault rifle– perfect for expanding your arsenal during your day of non-stop action!